Power comes down to two things. Money and People. When they have the money, we need the people! I have been told that you could hear the sound of the drums in the back ground. I do not remember this myself but do remember drums and other musical instruments there, so … why not? Sounds like something we would have been doing then. Playing drums and clanging cymbals and making noise in celebration of life and resistance to oppression. And if we were not, we should have been. Like the Canadian activists who have come out recently banging their pots and their pans during their protest marches! How cool. In 1988, in the Nevada desert, I was part of an event involving civil disobedience where about 3,000 people were arrested over the course of 10 days. I have read that this was the largest civil disobedience action in US history with a record of arrests. We were protesting underground nuclear weapons explosions to test and develop new and more dangerous bombs and missiles about 1,000 of which, could destroy most life on Earth. (There were about 70,000 in the world then, ready to launch) The demonstration was named “Reclaim the Test Site.” I had trained and prepared for this event for months. I had flown out here all the way from Montclair NJ to meet my crew. They had driven out earlier, caravan style, meeting up with other caravans and rolling into “Peace Camp” within hours of many others that I had spontaneously coordinated by phone and fax back in our office in Montclair before driving to Newark Airport and boarding a plane to join the fun. (This was all before cell phones… Members of other caravans from the South and the North East and the East, and the North West called in to their headquarters by pay phone… Does anyone reading this remember those?) I spoke with their home offices. They, in turn, would let their folks — who would call in from time to time – know how far in miles they were from some other group of fellow travelers and on what particular route some other caravan from some other part of the country might be. Some joined up en-route thanks to this. Some joined up outside of Peace Camp. Others aimed to roll into peace camp as close to a common arrival time that we organized in an impromptu fashion over the phone. Me with my map spread out on my cluttered desk with my speaker phone in front of me… No google maps in them days … Most of the travelers arrived on the same day within hours of each other… an intermittent procession of caravans arriving from all over the country. I imagined cheering campers greeting them, which indeed is what I was told later actually happened. This helped build solidarity and gain us some local media attention too. I was up most of the night alternately on the phone and at our brand spanking new copy machine, my back pack and travel gear stored on the floor by the door, as I was running off materials for a professional door-to-door canvass we had organized as one of our contributions to this effort. While the protest was set for Nye County, the canvass was in Las Vegas, which was the next county over. Since none of the money we collected was for the protest, but to set up a group in Vegas of locals who would call for conversion of the test site to peaceful purposes, we were completely legal,– much to the chagrin of Las Vegas police who wanted to arrest us, like their Nye County Compadres, but were unable to. So… Ha! My crew, all experienced professional canvassers, had caravanned out to meet some other canvassers from other canvass offices — most from SANE/FREEZE, (The Committee for a SANE Nuclear Policy merged with the Nuclear Weapons FREEZE Campaign.) Some were committed to the canvass, and others were committed to the action and planning arrest. We were well represented. When I arrived just hours after most of the caravans got there, I disembarked at Las Vegas Airport. As I got off the plane the very first thing I saw drove home what we were really resisting. I saw a line of Slot Machines. “Yes” I thought to myself with a wry smile. “Makes sense”. I was up and animated when I got to Vegas thanks to the excitement of the occasion and adrenaline in my system, despite my tired state due to a night of little sleep. (Exacerbated by the little plastic bottles of bourbon I drank on the plane.) I made my way to the temporary office for the American Peace Test in Las Vegas. The American Peace test was, in a way, a splinter group of sorts, breaking off of the larger FREEZE Campaign to mount increasingly militant, disciplined, civil disobedience against the US nuclear weapons program, and the US’s overall policy of militarism. They coordinated with groups protesting in Greenham Common in England and at the test sites in, what then was still, the Soviet Union as well… making this a truly global organizing campaign. Most Americans would have been shocked and in denial of the fact that there was a robust peace movement in the USSR in those days. Some of the canvassers took what they made canvassing and leveraged it at the gaming tables. One guy won enough money to buy an airplane ticket back to Los Angeles, which was fortunate as he did not have a return plan when he got there. All of us took advantage of the very cheap food, steak dinners and the like, and cheap booze that the Casinos made available to attract out-of-towners to come in and lose their savings. What a racket! But it was, after all, Vegas! Back at the office there was a kitchenette kind of deal, with a sink a very small refrigerator, and a microwave. We lived on peanut butter, bagels and bread, and some whole wheat pasta which I would cover with tahini sauce. At Peace Camp there was a communal kitchen with lots of … well… chili and salad I imagine… I never ate there myself. We ate pretty well off of the money we canvassed. Which was also OK because the contract called for paying us from revenues that we raised while signing people up. Not a bad system. The whole operation was run on consensus, which immediately ended my role in the canvass as a leader as soon as we had our first meeting. It stung my ego but enriched my soul. I was suddenly no longer the architect of this unique first ever organizing model, but simply the driver and another canvasser. It was kind of liberating in a way and immensely satisfying seeing everyone step up and take responsibility. My ego healed quickly. Upon arrival I met with an organizer or two. The details are a bit hazy, but we arranged, from previous contact, to have access to either one of the two rental vans that were around to bring people to and from the office to Peace Camp and back. We also arranged whose couch I would sleep on as I did not have a tent at Peace Camp. I don’t remember getting much sleep anyway. As I remember I moved around a lot, staying on the weekend with other canvassers and activists at some out of town lawyer’s home for a night and a day. I was charged with going to the grocery to pick up food for a large group meal, and since I had not yet gotten my paycheck, I was to do most of the labor for my part of the meal. When I got to the super market, I dropped a few quarters (all I had left) into one of the slot machines up front and won enough to cover my share of the groceries and a little extra, saving me from a night of indentured servitude at the whim of my fellow activists… WHAT a relief. Capitalism came through for me that time. We would have access to the van at around 2:00 PM each day to bring people to the City and then, after meeting and preparing for the field at about 3:00, we would drive canvassers to their neighborhood and drop them off. Then I would drive back to the office, and pick up whoever needed a ride back to Peace Camp. Then I would turn around, and head back into the city giving anyone who needed it, a ride and drop them off. If I had time, I would go out and canvass. If not I would just go and pick up the crew. Then drive back to Peace Camp. To get around during the day or on the weekend, I used the little red Mazda owned by one of my crew, a young man with blond dread locks. 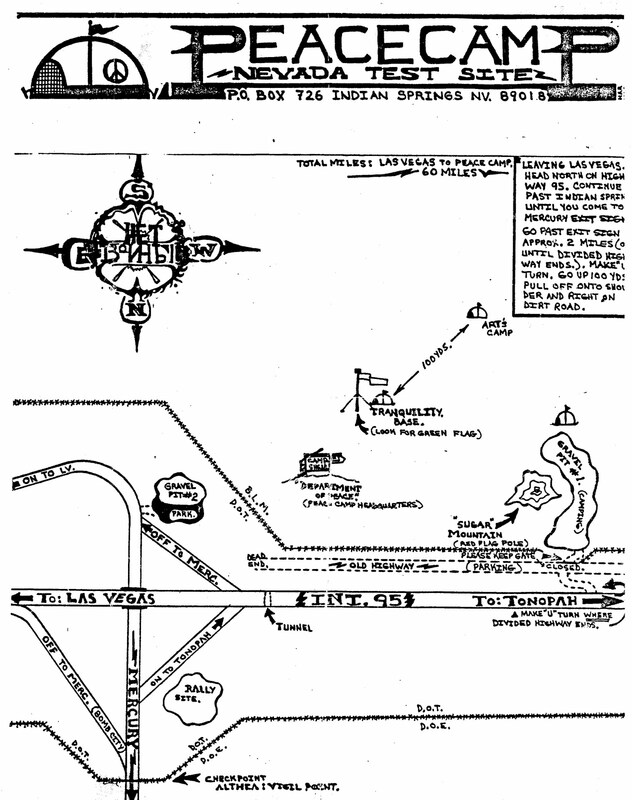 I found myself going back and forth to the city for various reasons during the day while some members of my crew joined hundreds of others crossing the line and being abducted by Wackenhut Security on the test site grounds and put in a large metal “pen” in the desert until they could be loaded on buses and driven to the town of Tonopah, some 65 miles from the vicinity. We called it “The Cage”. It was a 28,800 square foot chain link fence built in the shape of a square near the South Entrance not too far from the road. As activists crossed the cattle guard at the gate’s entrance, or scaled the fence, they were picked up by security guards, some on foot, some driving souped up dune buggies. Once herded into the “cage” they were taken, as a group, to the buses. The first time this happened, on the first day of the action, it was not expected… Organizers scrambled to find all manner of vehicles and gave chase. After about a day or two, we got really good at following the buses and retrieving our folks and getting them back to the scene of the demonstration pretty quickly thereby effectively thwarting the Nye County Sheriff’s office in their plan to break the civil disobedience. The reasons they cited for this strategy, to bus our people far away, showed our evident effectiveness at gumming up the system, which, at its root, is one of the reasons for civil disobedience to begin with. Still, Nye County prosecutors stopped filing charges against most trespassers here a year ago in an effort to ease the county’s mounting court load. So it was obvious that all of that work, demonstration after demonstration, was paying off from a tactical point of view at least. But was it paying off strategically? A most important question. While the department of energy denied any effect on operations, which was true at the time, the effect on political policy was another matter. Representative Pat Schroeder, a Congressional ally from Colorado introduced HR 3442, mandating the cessation of US nuclear testing (and thereby British tests, since they used our test site for their own nuclear tests… stopping the US would stop the Brits… A twofer) so long as the USSR maintained their moratorium on testing. The bill eventually gained over 100 co-sponsors, but was never voted on. Schroeder claimed its support was influenced by the civil disobedience at the test site. The Soviets ended their unilateral moratorium on February 5, 1987, but the last US test explosion was 4 years after Reclaim “The Test Site”, in 1992, though the amount of tests were vastly reduced before that time. However, later in 1988 the US and the USSR began the Joint Verification Experiment, where technical personnel from both countries traveled to each other’s testing facility to begin the actual monitoring program that would allow each to verify that the other side was not testing. So this, then, was the beginning of the end of nuclear test explosions by all countries to this day with the exception of North Korea, and it looks like possibly Pakistan (and then maybe India?) again soon. We have to organize to stop this if we can! In 1992 the US Congress passed the Hatfield-Exon amendment, cutting funds to achieve a nine month nuclear testing moratorium. This cancelled the last three scheduled tests for 1993. The ban has held ever since despite our Senate’s refusal to verify the Comprehensive Nuclear Test Ban Treaty signed by Bill Clinton in ‘96. My own belief is that what finally ended nuclear explosions was civil disobedience, like this action and the threat of continued demonstrations, along with millions of petitions, tons of letters and phone calls, and simply ongoing unrelenting pressure of ALL kinds from many, many regular folks from all over the place. There was also the largest single demonstration in US history to end the nuclear arms race, earlier in Central Park in 1982, which can be seen as the start of the final grass-roots push to end all nuclear testing. Protests had been going on since the beginning of nuclear testing. The nuclear weapons freeze referendum passed in many states across the country before being defeated in Congress… which helped change tactics to a more militant variety culminating in the mass arrests at the test site. Who knows? The increasing acts of civil disobedience (CD) HAD to worry policy makers. As the protests and CDs grew in frequency and numbers I am sure, it is only common sense, that despite official denials, it had to worry those in power that this kind of thing might continue to grow until it got unmanageable. Back in the late 80’s a one judge, Judge Sullivan, after listening to an emotional appeal from a family member who was in court on his trespass charge (which they received at the Test Site) stopped the proceedings and told the court and everyone there that “I just want you to know I think you are making progress through your efforts.” according to a personal account in a book entitled “A Family Says No to Violence: Personal Empowerment through Nonviolent Civil Disobedience.” by Sally A. Mack. We must never underestimate our own power… It is, after all, all we can count on in the end… and when united with others, we can multiply that power to make real, and often lasting change. But our power is not like the power we resist. The power of greed, suicidal greed, when one thinks of the polices that give us realities like 70,000 nuclear weapons, “Shock and Awe”, addictive use of fossil fuels resulting in increasing average global temperatures, and the very real and staggering threat of a possible runaway greenhouse effect. Their power is massive, it seems to be everywhere, but it isn’t. It is pervasive, and it is coercive. Ours is different and, when planning to resist and work for change it is always, in my opinion and that of many experienced organizers, best to organize from a place of your own power. As a matter of fact, Saul Alinsky, one of my early organizing role models, had set down some principles for us to use when developing strategy. He said, we need three things to give an organizing campaign a decent chance of success. 1 – Give your people a sense of their own power. You do this by organizing from your own experience and outside your opponent’s experience. Mass CD is often a good case of this, but not always. It is good to assess the degree to which your target understands and knows how to respond to CD. 2 – Alter the relations of Power. Doing things outside their experience can win you a seat at the table. There are still dangers to be sure, and nuclear weapons still need to be abolished because they still pose a very real threat to each of us and all life on the planet, though we ARE in an undoubtedly safer position than we were in 1988. But in terms of the goal of the campaign for the Anti-Nuclear Arms movement, I would say that if we can succeed in achieving a ratification of the Test Ban Treaty in the Senate, then we have won and we should have one hell of a very public and audacious party to celebrate because we need to, for our own psyches, reward ourselves for a hard-fought campaign that many of us sacrificed much for. But as importantly, we need to organize that celebration as a national event. We need to put some resources into it to give notice to those in power that – yes — we DID win. We went up against the most powerful death machine in history and we pushed it back from the brink and saved us all from annihilation. We have no choice if we want to live. Because as soon as the hangover wears off, we will be planning our strategy for our next campaign to make this world we live in a better place to live the kinds of lives we want to live and that we all deserve. So, to spell it out, what I am proposing is a national celebration as a campaign strategy. The powers we resist threaten to do us all in, globally and in our own neighborhoods. All to serve a system which more and more people have witnessed serves a very few at the expense of an increasing number of people at the bottom. A growing, and REQUIRED underclass that must exist for this system to operate. This is what we resist: A war around the planet, and one in communities of poor and African-American people and other people of color and people who are divergent from the main stream life style. We resist a system which pits us each against each other to purposely keep us divided so that we never learn our power. The power of our numbers. The power of the many, the power of people, the power that has been seen throughout history to eventually overthrow the tyrants that have oppressed them time and time again. The Power of unity. The power of love! A power we can realize when we break down the barriers and differences that divide us and when we learn that everything IS connected. Like the power of 3,000 people from all walks of life and an amalgam of backgrounds that came together in the hot Nevada Sun to stand up to the nuclear nightmare that had been created to threaten us all just to profit a few. It is the same power that we use when we reclaim our streets by building community and sharing the burden to make the streets safe to walk again. The power to change how we raise our children so that they suffer less trauma than we have, and can grow with understanding of, and compassion for others. Nothing else will do… There is no other way for us to survive, otherwise, as things progress and resources dwindle and new ways of organizing society are called for, we won’t be competing and killing each other to eat, but feeding each other to prosper. We ARE all in this together. So far, there is no other planet we can go to and the world as we know it keeps getting smaller. We must choose to run our own lives, personally and as a community. Power structures HAVE to change. Patriarchy, and yes, Capitalism, at least in its current form, must become a thing of the past. We must evolve or perish. There was a time, not too long ago, when the world had 70,000 nuclear warheads poised to launch at a moment’s notice. They were aimed at various points on the globe, but roughly 60,000 of them were armed to explode on and incinerate and destroy most of the cities in the US and the USSR. This was an existential threat…. that threat still exists today, but it is arguably, in relative terms, much less… There are now 17,300 armed poised devices. You can imagine my relief. Yet this IS a welcome change. Still, many of them are more accurate and … if it were possible to be more deadly than 60,000, they may be more so upon impact, which may be irrelevant, since their use would most certainly be just as deadly anyway. This is because the far reaching effects will get just about everybody in the end. I mean, how many times can you destroy the planet anyway? There are still too many. There are too many weapons… of all kinds. It has been said that the world is awash in weapons and, of course, this alone is not the only threat, though these weapons magnify it and make the threat more likely by their very being. The other threat that needs to be addressed to reduce the chances of their use is human beings willingness to use them. Even more important is our willingness to hurt others. This is part and parcel of their destructiveness and begs the larger question of how do we achieve safety and security? I will come back to this question in its more fundamental aspects later. For now, back to world annihilation. Many of these bombs are no longer pointed at cities, and many are on hold. In storage if you will… only a few thousand still stand ready to be launched quickly… and the overall “threat level” or Def-Com as it is referred to by the military in the US, is set lower so the chance of a so called “hair trigger” response is less … somehow, I still feel unsafe when I think about all this. When I contemplate their use… the effect these weapons would have on me, and those I truly love, who are close to my heart, especially if they do not live close by, it is deeply frightening. If these loved ones lie on their deathbed, I should be able to get to their side, but how can I even view their remains if we all go up in a conflagration such as that? This is a numbing consideration. It is the kind of threat that is obliterating in all its manifestations. Disempowering to even think about. This is so big, bigger than each of us, how can we ever do anything about it? How can this change? But as noted above, it already has. And this did not simply happen. And it was not at the whim of those who directly control and create this monstrosity. It happened because of the countless efforts of people like me and you. It changed because enough people, not everyone, but enough people demanded it and, some, many, broke society’s rules to force the change. It was not easy and much work remains to be done…. The outcome is not certain which, in itself, demands that further action be taken or the unthinkable may yet happen. It took direct action. It took actions large and small. It took civil disobedience and the guts to face arrest and abuse both legal and physical. However, UNTHINKABLE is what this cannot be! Because to be changed it requires us to think about it and face it head on to deal with it and bring about the change we wish for. There is no other way. Denial will get you in the end. So true of so much that holds us back and hurts us. How to overcome the denial and the numbness and the inaction about this? Like an addict, or an abuse victim our world keeps functioning at this level of insecurity, wondering why life now seems depressing and simply not enough, wondering why it is all so bad out there, and often overcome with the strong desire to distract ourselves with all manner of inducements and intoxications… our fear and denial prevent us from facing these horrors that stalk our nightmares. But like addicts and abuse victims everywhere, the first step is to admit we have a problem… the second is to face our fear, not an easy task, and then to take action. In essence, to become survivors! Even small action counts. Small action can build up to big, more effective action and we gain strength and confidence in ourselves and our actions when we take them a bit at a time. We make progress, sometimes slowly, and there can be set backs… but if we look back along the road we can see that we have made progress so, after a much needed rest to recharge, we are required by our need and call to change that we get back up and continue onward. The promise of healthy joy-filled life demands it. We cannot have what we really want, what we all really want, deep down, unless we overcome the fear and the denial that prevents us from taking action. Then we can sort things out. It is important to realize that there are some things that cannot be avoided and some things we cannot affect… and many things we should not control… A compassionate young man I knew was recently lost to us due to what we think was a massive heart attack. Maybe he could have taken action to prevent it. But it is also true that there are heart problems in the family and it may have been a congenital issue. There is no way to control for that. Some things we simply cannot help. But the question is not about control. That attraction has more to do with powerlessness and control is the flip side of denial, because to affect healthy change one must take account of the forces that one is trying to affect and deal with, or overcome if need be, and what keeps us from the changes that need to be made. One must also be mindful of the other players and why they want control, because, like me or you, they too want the same things and are dealing with similar fear and denial and are obviously losing that struggle to the deleterious effect of us all… so instead of control, which in and of itself is at issue, we should instead, if we wish a healthy outcome, seek appropriate engagement, and when necessary compromise… nothing else will do. That is not to say that we accept abuse or oppression, but our struggle with it will only succeed in the long run if we do not fall prey to the same afflictions as our oppressor, for if we do then our oppressor has already defeated us and positive, healthy change cannot come about. Our oppressor may have suffered, but we do not have to become like them and we cannot heal them unless they heal themselves. We CAN be an example and show them the way. Then we all win. Though we cannot make them follow us, our example may be the best we can do. Cooperation is better than control unless you are so afraid that you are too weak to accept others, and if so, and you embrace control, you are by your actions allowing a battle you may lose as you are giving the other the “right” to be an opponent, rather than a partner in the search for security and a healthy life. To achieve a healthy life, if it be an engaged one or a separate one, for anyone to have security, we must accept the security of others. Appropriate boundaries are the key when we live separately. But we must also remember that any separateness is in degree only, as all things, each of us, are connected to everything else and each other too… There is no getting away from this. This is an inevitable truth about the universe as vast as it is. I will show evidence later for this notion in future writings. So considering all of this, how did such a large change in our existentially threatened, connected lives occur? How did we manage to take such large steps back from the brink of possible destruction in such a short time? Just 28 years. By facing the disease head on and taking action. I took an active part in this story and as such, I can share personal experience of my part in it. I went door to door for the Committee for a SANE Nuclear Policy in the 80’s. But I started my activist career on Long Island as a professional canvasser for the Citizens Alliance, which was the community organizing project of the Public Interest Research Group, or NYPIRG. This was one of the original student run organizations that was part of the Ralph Nader family of groups working for progressive change through state legislation and public education and in the courts. This “movement” was reformist and left of center, non-partisan and targeted at the so called middle class. The Citizens Alliance was a classic attempt at grass-roots organizing right out of the Saul Alinsky play-book so it was a bit more radical at its core than much of the rest of the Nader Network and was really about politicizing middle class suburbanites as a way to erode their electoral support for the Reagan agenda. But the Alliance worked mainly in neighborhoods of color and poor white neighborhoods so their experience was different from the reformist crowd. In truth it was a good place to cut my political teeth. We canvassed on a variety of issues, many chosen not just for their importance as issues but because of their relation to the populations we were targeting. As such the issues we talked about were familiar and, though controversial to some degree, hardly the kind that would radically change the system in any fundamental way in terms of anything thing like capital and empire. Though in its defense it did foster democracy and politicized a large part of the population to help advance a healthy kind of populism. In terms of the context of this article, I mention all of this to explain that by and large, though any kind of canvassing can be challenging and, in truth, so outside most people’s experience that it takes a rare individual to be good at it depending on which kind of canvasser one is. I digress here for a moment but this will give you a context to, hopefully, give you a better idea of the challenge we faced.. Though there exists in the world of political canvassing a wide range of flavors, most of it falls into two broad categories. They are what I would call politically oriented or financially oriented. While both consist of raising funds and setting quotas as an intrinsic element of the tactic, (And fundamentally, canvassing is a tactic) one category has its focus as politicizing populations and seeking a grass roots base of support for organizing through memberships and grass-roots pressure on policy makers and corporate targets. The other is much more concerned about building a financial base of donors as the main purpose (though both kinds do this). Now having stated this, my point in terms of this story is that I gravitated to and had the good fortune to be part of. the more political variety. As a matter of fact I was pretty good at it and as such became a leader and this gave me opportunity to be an early, and in my day, a somewhat influential one at that, doing all that I could to push the organizations I worked for toward more political kinds of outreach. You see, I wanted to be a real organizer in the worse way and helped develop the early canvass as a political outreach and organizing tool as much as I could. So my experience was that canvassing on issues like rent control, or toxic dumping and other environmental hazards, even stopping nuclear power or working to get stronger regulation of utility companies and similar more reformist agenda’s over all, it was not too hard to gain significant support in most places I canvassed. My ratio of positive to negative interactions was somewhere around 50% or greater in most locations. That changed significantly when I began to canvass for SANE. Not only was this long time organization more political than the Nader flavor, which was enough of a challenge, but it was a leader in the US Peace Movement. The US Peace Movement, as distinct from the “Anti-war” movement, dealt with issues that were fundamentally at the heart of the struggle for freedom and justice and empowerment of the public against the system. A system that has had vast inequality deep within it for at least as long as this nation has existed. And its roots, in truth, go back much farther. But what really made it hard, as if that was not enough, was canvassing to end the nuclear arms race during its very height. With the exception of the struggle for voting rights and to resist racism and sexism, which I have also had occasion to canvass on, the nuclear arms race has been one of the hardest most polarizing issues I have ever brought to the average US citizen’s door because of two things. The first is the deep divisions in those days regarding the whole US foreign policy strategy which for so many sprung directly from the sense of “American Exceptionalism”. This notion that we are a chosen people has always been the tactic that those in power in this country have used to win over enough of the population to enable their militaristic, imperialist pro capitalist agenda. (If I may be so bold) Despite the growing change in attitudes by many more people these days about this, the idea of the US as being the good guys, still runs deep. But in the 80’s during the Reagan years, at least half of the people we talked to, and in many places more than half, were so afraid of the Soviet Union that even though majorities favored a nuclear weapons freeze, there was still resistance to arms negotiations and great suspicion of our movement. We had to learn to achieve our goals with about a third of the support of people in most places we canvassed. Why such a small number when the majority in poll after poll supported our core position? Because the other thing that we encountered that was very different from all of the other issues I have ever worked on, and this goes to the heart of my argument here, was simply an unwillingness to deal with the realities of a potential nuclear war. There was a deep “Psychic numbing” about the size and scope of the issue. And this was not only experienced by us as a characteristic of people who we canvassed, but many of us felt it ourselves… including me! I was not entirely convinced that we would be successful in our goals. Though I knew the odds were long, and I reasoned that our only chance was to ignite a movement for change, one of the ideas that kept me going was that if they were going to kill us all anyway I was simply not prepared to go into the night without a fight and if I could send any of the people we considered war mongers to bed having had a bad day as a result of our actions then I would sleep a little bit easier. One of my political hero’s was Alard Lowenstien. Now I am not normally inclined to find politicians of any stripe very heroic. They can be good allies, and often well meaning and righteous people, some with their heart and their beginnings in some social change movement or other. Indeed I have personally known of one or two who became involved after we canvassed them and got them to attend a grass-roots planning meeting. They became politicized after we brought them up against the system and they learned how corrupt it was. This was canvassing at its best. Mobilizing people for change. And there are other stories which I will share later of the potential effectiveness of this unique organizing tool. But that’s for later. Now Alard holds a special place in my heart because before he ran for office he was the lead organizer for the Student Dump Johnson Movement which helped mobilize grass-roots voters for Eugene McCarthy’s campaign, whose early win as the Anti-War candidate in New Hampshire and elsewhere helped propel Bobby Kennedy into the Democratic Primary. This, in part, eventually convinced Johnson not to run for re-election. So this guy helped engineer the political defeat of one the most powerful men in the world at that time. Alard used to say that nothing is for certain. The only thing that is for certain is that you either win or you lose, so you work hard as you can to win. This was the attitude that helped him succeed. The point here was that what we were doing in those days, that in my mind, was more significant than all the money we collected or all the signatures that were signed was bringing hope to the doors of many and helping open their eyes to the danger all around them. And despite the sense of futility that we and so many people we talked to door to door struggled with when facing this issue, the issue of the existential threat discussed earlier, we made a difference. We stepped into people’s homes across the country as we canvassed in a number of key cities in a strategic effort to effect congressional action by electoral district. We pulled them away from the TV and engaged them in a conversation about the state of the world and the fate of the earth and everyone on it. In those days the Congress was a bit less bought off and we were indeed helping to mobilize the deep grass-roots feelings against the arms race that already existed. We did succeed in crafting our message in a way that got around the fear of the Soviet’s by addressing a balanced verifiable approach and using logic and touching on people’s concerns and being as life affirming as we could be. We got good at our craft and worked hard on our communication skills in professionally run workshops in briefings and by reading and training daily. And we drew from the examples of great leadership figures such as Martin Luther King, Nelson Mandela, Gandhi, Aung San Su Chi and others. We were a well educated seasoned group and our canvass had a higher percentage of long term, very serious minded and very often older staff than most canvasses of the day. Many of our leaders were woman and we were very well indoctrinated in larger issues of oppression and the connections between them. And we convinced many people that any action, no matter how small, could, be important if we wanted things to change. As Ted Taylor, the Anti-War Nuclear Physicist told us, to paraphrase him just a little here, it would be better to strive with all our hearts to achieve a world that may seem too good to be true, than to drift toward one that is too dreadful to contemplate. We did this not just with canvassing, but with a crack PR department and a well run publishing arm that was renowned in Washington DC for accurate and informative briefings and carefully researched literature that we got out to a mass audience on radio, at colleges and events that we held all over the country. We were a respected background source by the Washington DC and New York News Media. We worked hard! And SANE had a rich history. Not a perfect one to be sure, but one with a strong culture of resistance to oppression and militarism including early and strong opposition to the war in Viet Nam and a close association with organizers in the civil rights movement. But a very concrete example of a small action making a big difference was the act of signing those petitions we carried around. One of the historic occurrences which helped turn the tide on the escalation in the development and deployment of ever more dangerous nukes was Gorbechev’s rise to power and his eventual challenge to Reagan, who, to a significant degree, was forced to the bargaining table by grass roots pressure which was vey much stimulated by SANE and the Nuclear Weapons Freeze Campaign. Of course there were many others besides us as well, too numerous to list here, but we played an undeniably large part in this struggle by virtue of our resource base… much of which can be credited to our canvass. In our first year we more than doubled our membership base and it continued to grow not only giving us more grass roots power, but fundamentally altering the breadth of our base and making it more mainstream and much less establishment liberal as the traditional base of SANE largely was. This was already true of the FREEZE and as the two organizations grew closer together and eventually merged, it changed even more. Though our leadership and staff were more militant, our base was a good cross section of the country. But getting back to the lowly act of signing petitions. In many cases petitions are not taken seriously by policy makers. This is a widely accepted notion and very often true. The success of petitions is usually more in their use to build lists of supporters, but when one knows how to use them correctly they can actually make a difference in swaying the politically powerful and public opinion which in turn can have the same effect. You see, one does not have to perform acts of civil disobedience, or risk their lives to make change. Some will have to, and maybe in growing numbers, and they will need our support, but even very small acts can have an impact. EVERYONE does have to do their piece of the work. There is a line in the Koran that speaks to this. It says something like that. That everyone has to do their piece of the work. It may be a big piece. It may be a small piece, but everyone has a piece to do. In this case millions of names played a key role in an important public relations event that was picked up by major media and helped propel both the US and the USSR to end all nuclear explosions in the testing and development of new weapons. A ban that has held to this day. Though a test ban treaty remains elusive, both the US and Russia still maintain a voluntary cessation of live explosions and this is a good thing. This ban helped warm the cold war and made the eventual reductions in these weapons that I began this article with possible. And the petitions helped to create that atmosphere when our delegation to Moscow, led by Jesse Jackson, attempted to present them to the Reagan delegation at the summit talks. When Reagan refused to accept them, this played into Grobey’s hands giving him a distinct political PR advantage when he not only accepted them, but had a field day with the press touting them as representing the peaceful aspirations of the people of the World. This put even more pressure for Reagan to meet the Soviet Ban on testing, which Gorbechev had already initiated. I personally collected hundreds of those names and the day before our delegation left for the Summit I helped box thousands of them with my staff on the floor of our New York City office blocks from where Norman Thomas had done community organizing years earlier in Soho. Those names played a role in a historic event. Each person who signed helped make a difference and from this I have learned that no action is too small. One never knows what effect a positive action may have down the road. This has been my experience on many occasions and the point here is that even in the face of a strong attraction to, and in a pervasive environment for, the aforementioned psychic numbing that kept many from acting, we were able to demonstrate that action can work. Indeed, without it we will be doomed to failure. Action, of course never guarantees success, and I cannot tell you that action will promise victory, but I can tell you that in the face of threats and hurts and abuse of all kind, non-action will ensure defeat. And we must remember all of this as we work to rid the World of ALL weapons of war, the rest of the Nukes, and everything else too… As we work to eliminate poverty, and end racism, sexism and cruel behavior of all kinds. We live in a world where there is so much unnecessary hurt and pain and so much less love than there needs to be. We live on a planet that can provide for us all…. There IS enough to go around and there are solutions to climate change and most all of the ills that we suffer. The rich and powerful have to learn to share and play well in the sandbox that is the Earth. A better world is possible, but we first have to believe in it. Then we have to get to work. But all of this will require us to get past our fear. It will take courage and we will all have to help each other. So things may seem hopeless, odds may appear insurmountable and depression may sometimes consume us but if we allow ourselves to wallow in it, if we accept our lot and fall prey to the weight of our own disempowerment, if we allow ourselves to remain victims and shrink from a struggle for our own lives then we will not become survivors but we will be defeated, at least in part, by our own hand. In the end it is up to us to take action. In the end there are only two choices. We may need to reach out for help and support and we may not be able to turn the tide alone, but we cannot permit ourselves the distraction of complacency and immobilization. We have to overcome our fear and have the courage get past what terrifies us to live the healthy lives we wish to live and that we all deserve to live. The wealth distribution in this nation is appalling. This is why it is becoming more difficult to make ends meet. Are you feeling the pain? Thom Hartman wrote a book in which one chapter explores “What is Enough”. He presents different perspectives on being ‘rich’ and being ‘poor’. While they number fewer than one percent of all humans on the planet, the result of a relentless 5-millenium genocide by our worldwide Younger Culture, there are still people alive on Earth who are members of Older Cultures that predate the Mesopotamian city-states. There are also people whose Older Culture ways have only been so recently taken from them-such as many Native American tribes-that while they may no longer live the Older Culture way, they remember it. In these Older Cultures, the concept of “more is better” is unknown. They would consider “greed is good” to be the statement of an insane person. One person eating near another who is hungry is an obscene act. The ‘Older Cultures’ regard wealth not as goods and services. Instead, their view of wealth is security. In Older Cultures, the goal of the entire community is to get every person in the community to the “enough point.” Once that is reached and ensured, people are free to pursue their own personal interests and bliss. The shaman explores trance states, the potter makes more elegant pots, the storyteller spins new yarns, and parents play with and teach their children how to live successfully. Contrast that to the quest by people like Sheldon Adelson and the Koch brothers. For them, there is never enough money in their bank accounts. They don’t own enough ‘things’ so they keep striving for more and more. If they lost everything today, they would have nothing because money doesn’t buy true friendship. Who really likes a greedy person? No one. Yes, in their own words, they will privatize Social Security. This is what the voters of Pennsylvania voted for when they elected Toomey. Yes, Tea Party members and Patriots, you will have to hand over your Social Security to the thieves on Wall Street and you can kiss your Medicare good-bye. And you voted for this because there is a black man in the white house. Sorry to say that racism is alive and well in the “guns and Jesus” parts of Pennsylvania. One more thing, Tea Party members and Patriots, you better start bottling your water because once the gas drillers come into your neighborhood, your water will not be safe to drink. This is what will happen because you voted for Republicans to control Harrisburg and they support the rights of the gas drillers and NOT your rights. Fools. If you can’t support our vets, then what good are you, Toomey? You’ll never stand up for Pennsylvanians.